We are delighted to offer another great year of Senior Specials! 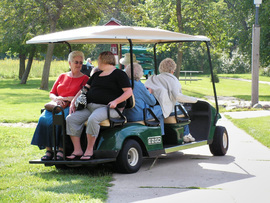 Patrons age 55 and older are invited to join us for FREE coffee or tea and a cookie, a program or concert, and an optional opportunity to take a guided tour of the Nature Center trails on one of our two access vehicles. Preregistration is REQUIRED for all of the programs, with separate access vehicle signup. Themed trail tours are back by popular demand! Following the program and refreshments, the optional 45- to 60-minute trail tour will be led by our staff, guest presenter, or volunteer resident expert and will have a specific nature theme. Call 507-437-7519 or email info@hormelnaturecenter.org to reserve your seats for the programs and/or trail tours. Free, private tours on our trail access vehicles are also available—scroll down for more information! (The Interpretive Center also has two wheelchairs for use on the trails at no charge.) Call 507-437-7519 with questions or to schedule a tour. In conjunction with Water Festival Week, come enjoy a new play from the Ikidowin Acting Ensemble—“We Do It for the Water,” written by Sharon Day and directed by Sir Curtis Kirby III. Back by popular demand, discover the joys of nature with entertainer and naturalist David Stokes! Audiences of all ages will enjoy David’s amazing energy, live critters, songs, and short stories about the natural world. Thursday, July 18; 10:00 a.m.: "Bird Tales"
Ever wonder where bees go in the winter? How do they really make honey? Are bees really disappearing? What can be done to help? How many bee puns can one person possibly make during a one-hour presentation? These questions and more will be answered by Will Bjorndal, former Hormel Nature Center intern, beekeeper, citizen scientist, and all-around bee buff. Will will discuss both Minnesota’s native bees and honey bees; he’ll also have live bees in an observation hive, and honey to taste! RSVP by July 24. Midwest folk duo Fendrick & Peck call themselves “budding naturalists” and find real healing in the woods, waters, flora, and fauna of the world. Their music touches on this and more, gathering in many genres with a freshness and originality that centers on harmony, lyric writing, composition, groove, and heart. Brian's instrumental work and Madeline's tremendous energy pair for a wild and soaring ride. Together with guitar and mandolin in hand, they enjoy sharing their music with fellow nature lovers! Listen here: www.fendrickandpeck.com/listen. Thursday, August 15; 10:00 a.m.: "Bear with me! Learning about Black Bears"
Come join 2019 naturalist intern Andie Harveaux as she shares her experiences from three summers working with black bears in Northern Minnesota! Her presentation is filled with facts, sprinkled with stories, and littered with pictures. RSVP by August 14. Austin favorites Lee and Judy Bjorndal perform a variety of songs of bygone days. Judy’s background in vocal and band music combines with Lee’s experience in bluegrass and country to form a duo that plays a wide range of music. For most sets, Judy breaks out her trumpet, playing and singing from the “Great American Songbook.” A typical set might include old-time songs, something Stephen Foster, a gospel tune, a couple of swing tunes, and a comedic song or two. “We try to play some things that people know, and have a few surprises also,” says Judy. RSVP by August 21. Click here for details on all our upcoming programs, and use our calendar of events to help plan your summer! Private tours on our trail access vehicles can be scheduled with advance notice (a minimum of four days), seven days a week, spring through fall (based on trail conditions and the availability of volunteer drivers). Please call 507-437-7519 for more information or to schedule a tour. This is a free service funded and provided by the Friends of the Jay C. Hormel Nature Center. The Interpretive Center also has two wheelchairs for use on the trails at no charge. Trail access tours are designed for patrons who need assistance to access the trails and are also provided with the Summer Senior Special programs. Are you interested in joining our team of volunteer trail drivers? We provide training for the vehicles and the tours.